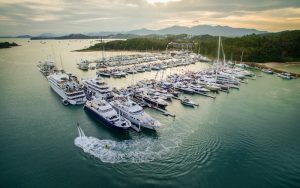 Phuket (Thailand) – February 22, 2018 (travelindex.com) – Over the course of the next few days, some of the world’s most prestigious marine lifestyle brands will be present at Ao Po Grand Marina in Phuket for the third edition of the Thailand Yacht Show, taking place from Thursday 22nd to Sunday 25th February. The growing destination for the world’s high-spending yachting community, Phuket will host thousands of nautical lifestyle enthusiasts, including potential buyers and charterers who are invited to climb aboard and experience an impressive display of watercraft featured in the Show. Available to try out will be yachts, superyachts, catamarans, sailboats, sports-fishers, dinghies, tenders, water sport boats and day cruisers, in addition to exclusive activities and alluring social events. The Thailand Yacht Show (TYS), presented by Verventia Pte Ltd, organisers of the Singapore Yacht Show, and sponsored by the Tourism Authority of Thailand under the supervision of the Ministry of Tourism & Sports, is fast becoming an event of truly international standing, bringing together leading brands and dealers to present their most popular products at the Show. This year’s exhibitors include Asia Marine, Asia Yacht Agency, Azimut Yachts, Boat Lagoon Yachting, Cholamark Boat Co, Fraser Yachts, Lee Marine, Multihull Solutions, Northrop and Johnson, Princess Yachts, Sky Marine, Sunreef, and Sunseeker, amongst many others. Visitors will also be able to admire and even get on board stunning superyachts from some of the world’s biggest and best-known brands in the industry, including Feadship, Ferretti, Heesen, and Perini Navi. Unlike any other boat show in the region, TYS is a “Try-it-and-See” event which offers an immersive experience for both seasoned aficionados and newcomers alike. Morning cruise trips, live demonstrations and electric parties will allow visitors to discover the luxurious yachting lifestyle. Interactive activities – hopping on board for a quick cruise at sea or trying out the latest in water toys – will let interested visitors try everything out first hand. Sustainable mobility and some of the latest developments towards mindful conservation at sea will also be part of the show at TYS, with electric boats and cars presented by sponsoring partners Torqeedo and BMW. The stellar line-up at this year’s show includes some of the world’s biggest and best superyachts, including the 90m Cassens-Werft-built Lauren L, the biggest yacht ever to be exhibited at any show in Asia and presented by Titan Fleet Management, alongside Feadship’s 60m motor yacht M/Y Paraffin which will be presented by Fraser Yachts. For those looking for an exquisite and timeless yacht, this is one of the most luxurious yachts available for charter or sale on the market. She can accommodate 12 guests in six staterooms and has ample interior and exterior space for relaxing and entertaining. Her wine cellar is as enviable as is the range of toys and tenders on board. Ferretti Group’s Custom Line 47m M/Y Happy Days will be available for private viewings with Lee Marine. A powerful motor yacht with a top speed of 28 knots, this is the perfect yacht to discover the Andaman Sea. Also included in a fleet of some 15 superyachts is the 38m classic sailing yacht S/Y La Numero Uno, the very first yacht built by one of the most elite names in the industry, Perini Navi. One of the most luxurious sailing yachts available for viewing at the Show, she is available for charter through broker Asia Marine. Multihulls remain popular at the Thailand Yacht Show due to their fantastic interior and exterior space, as well as the great stability they provide while underway and at anchor. Visitors to the Show will be treated to look at some of the world’s most prestigious brands – Fountaine Pajot presented by Multihull Solutions, and Sunreef exhibited by Northrop and Johnson. The ITAC 54, designed by world-renowned Italian naval architect Riccardo Bulgarelli, will make its world debut at the Show. Presented by Multihull Solutions, Asia Pacific’s leading multihull specialist, this new long-range passage-making catamaran delivers the features and performance of a 70ft monohull with the benefit of being easy to handle without additional crew. Offering the finest in luxury appointments and finishes at a price that challenges production power catamaran models, the ITAC 54 combines impressive power with economical range. Northrop & Johnson will be presenting the 18m sailing catamaran S/Y In the Wind, built by Sunreef Yachts, producers of some of the best catamarans in the market. With the space to accommodate eight guests, her saloon opens seamlessly into the cockpit offering the space of a larger vessel. Set up for adventure chartering, guests have access to stand-up paddle boards, dive equipment, and wakeboard amongst other activities. For those looking to trial a Catamaran at sea and get a feeling for the enormous space and stability they provide, the ever-popular HYPE will be hosting a series of morning cruises around Phang Nga Bay and some of its iconic limestone islands. Guests will be able to venture out and enjoy some swimming and snorkelling before the Show opens. The Thailand Yacht Show offers something for everyone and every budget – from superyachts and charter holidays to all other aspects of the leisure marine lifestyle. The latest marine toys and water sports such as stand up paddle boarding by Sea-Doo, and the latest cool water craze, the Schiller water bike, will all be available for trials at the open Demonstration Platform. Visitors can chill while floating on bean bags from Soo Santai or attend live demonstrations and be amazed by professionals showing JetBlade and JetSurf equipment. Complementing the Show will be a glamorous social calendar which includes electric private parties on board superyachts, a floating VIP Lounge, supercar parades and VIP morning and dinner cruises. Visitors can start the day enjoying panoramic ocean views by cruising around the Bay’s paradisiacal islands on board the luxury catamaran HYPE, which will depart every morning from the marina to offer the perfect initiation to yachting in Thailand. During the day, those considering hiring or purchasing a yacht or a boat or any of the latest water toys will be able to fully appreciate the products and enjoy Thai hospitality, as well as experiencing the fun of yachting, by joining scheduled cruises or sea-trials on board selected yachts and boats on display. Guests can expect sumptuous food and wine to be offered throughout the day on and off the water. Thai cooking lessons, street food vendors, night markets, sommelier-led wine tastings and chef demonstrations will complete the experience. The youngest members of the family will also be able to enjoy a day out at the Show at the TYS Kids Club, where dedicated activities will be offered just for them whilst their parents discover the best of the yachting world. To end each day the best way, visitors can board the lavish catamaran HYPE to party till late or head to Sunbrella’s D’Deck Bar to groove to live DJs over sunset cocktails. Yoga lovers can join Friday and Saturday evening Full Moon Yoga sessions at the Wellness Pop-up Spa. Phang Nga Bay, with its emerald green waters and stunning limestone islands, once again plays host to the third edition of the region’s premier experiential yachting event, The Thailand Yacht Show (TYS), staged in partnership with the Thai government. Returning to Phuket’s AoPo Grand Marina from 22nd-25th February 2018, the Thailand Yacht Show is unlike any other boat show, with visitors being able to actually get out on the water and try out a whole range of watercraft. Held during the Lunar New Year, one of the busiest times on Phuket when it is buzzing with regional visitors, the Show will place an emphasis on the experience guests will have and how it will enhance their ongoing yachting lifestyle. Combining the best aspects of yacht charter, the boating industry and luxury lifestyle events, the Thailand Yacht Show attracts industry professionals and consumers alike and is fast becoming the focal point of the developing luxury charter yacht business in Asia Pacific. Verventia is a business catalyst, providing marketing platforms for introducing suppliers to distributors, and global audiences to lifestyle products and services. The company’s portfolio of events and extensive connections facilitate the integration of networks to stimulate industry growth and business development. Well-versed in the implementation of successful event and project management, the experienced and professional team at Verventia are fully dedicated to deliver world-class events in unique venues around the world. Verventia’s current portfolio comprises the Singapore Yacht Show, the Thailand Yacht Show, the Asia Pacific Superyacht Conference, the Asia Boating Forum, and – new in 2018 – the Singapore Collection and the Asia Pacific Waterfront & Property Forum.